Summary: The salutation to Titus is actually a compact doctrinal statement, which lifts up “His word” as the source of the truth that reveals the way to eternal life (1:1–4). Titus consists of three short chapters written over twenty centuries ago to a little-known missionary on an obscure island by an aging senior missionary—“can there be any relevance here for modern-day Christians?” Actually, it has a great deal for Christians today, in fact, If it only contained the words of Paul (and many liberals will not even grant that) it would still be of interest to history buffs. But this book, as well as the other sixty-five books of the Bible are God's words, not Paul's. Therefore it makes a contribution that no other book can make. The subject of elders (preachers and deacons) supports a similar teaching found in 1 Timothy. Some would say that it is only a repeat of the 1 Timothy teaching. But you will find that God uses repetition through-out the Bible, and especially in the OT. Probably the most loved passage in Titus is 2:11–14, concerning the doctrine of grace. when He wants His people to grasp certain principles. Paul is the accepted author of Titus as well as the other Pastoral letters. The Mediterranean island of Crete is 156 miles long and up to 30 miles wide, and its first-century inhabitants were notorious for untruthfulness and immorality (1:12–13). 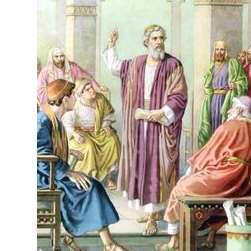 “To act the Cretan” became a phrase, meaning “to play the liar.” A number of Jews from Crete were present in Jerusalem at the time of Peter’s sermon on the Day of Pentecost (Acts 2:11), and some of them may have believed in Christ and introduced the gospel to their countrymen. Certainly Paul would not have had the opportunity to do evangelistic work during his brief sojourn in Crete while he was en route to Rome (Acts 27:7–13). The apostle spread the gospel in the cities of Crete after his release from Roman imprisonment and left Titus there to finish organizing the churches (1:5). Because of the problem of immorality among the Cretans, it was important for Titus to stress the need for righteousness in Christian living. False teachers, especially “those of the circumcision” (1:10), were also misleading and divisive. Paul wrote this letter c. A.D. 63, perhaps from Corinth, taking advantage of the journey of Zenas and Apollos (3:13), whose destination would take them by way of Crete. Paul was planning to spend the winter in Nicopolis (western Greece), and he urged Titus in this letter to join him there upon his replacement by Artemas or Tychicus (3:12). Paul may have been planning to leave Nicopolis for Spain in the spring, and he wanted his useful companion Titus to accompany him. Besides the general themes that Titus shares in common with the other two Pastoral Epistles, Titus gives a fine concise summary of how a believer should embellish the doctrine of grace with godliness and good works. Many today who seem pleased with the doctrine of grace apparently have little interest in displaying it in good works, or even godliness. Such an attitude is wrong and suggests a misapprehension of true grace. Paul sums up the theme perfectly: “This is a faithful saying, and these things I want you to affirm constantly, that those who have believed in God should be careful to maintain good works” (3:8a). 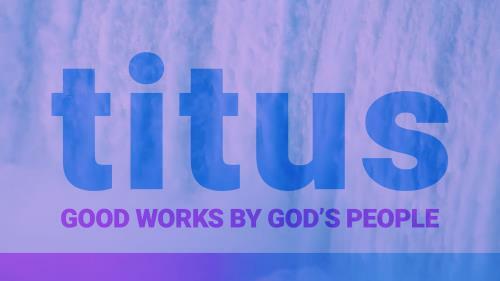 Titus, like First Timothy, was written by Paul after his release from Roman imprisonment and was also written to an associate who was given the task of organizing and supervising a large work as an apostolic representative. Paul left Titus on the island of Crete to “set in order the things that are lacking, and appoint elders in every city” (1:5). Not long after Paul’s departure from Crete, he wrote this letter to encourage and assist Titus in his task. It stresses sound doctrine and warns against those who distort the truth, but it also is a conduct manual that emphasizes good deeds and the proper conduct of various groups within the churches. This epistle falls into two major sections: the appointment of elders (1); setting things in order (2–3). The salutation to Titus is actually a compact doctrinal statement, which lifts up “His word” as the source of the truth that reveals the way to eternal life (1:1–4).